What could be fresher and brighter than orange juice, lime juice, and a rainbow of peppers? 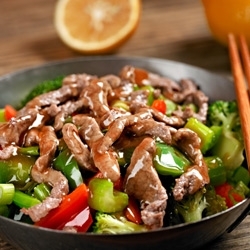 Add broccoli, beef, and a few Asian tastes, and you’ve got a quick and easy dinner that everyone enjoys. Place the beef in the freezer for 15 to 20 minutes, until firm but not totally frozen, for easy slicing. Cut into paper-thin slices against the grain. In a large bowl, whisk the broth, soy sauce, orange juice concentrate, lime juice, sesame oil, garlic, and ginger. Stir in the cornstarch until no lumps remain. Set aside. Spray a wok or large skillet with oil spray. Add the canola oil and warm over medium heat. Add the peppers, onion, and broccoli and cook, stirring, 4 to 5 minutes, until the vegetables begin to soften but are still crisp. Increase the heat to high and add the beef. Cook, stirring, 3 to 4 minutes, until the beef begins to take on color. Reduce the heat to low and add the broth mixture. Cook 2 to 3 minutes longer, until the sauce thickens and the beef is no longer pink inside. Garnish with scallions. Serve immediately.